This is the perfect pre-December book for pet lovers or that special young person in your life. 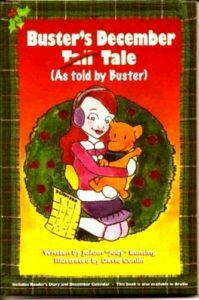 From beginning to end, Buster is sure to tug at your heart and delight readers young and old. The story includes a special visit from a plump fellow wearing black boots and a red suit. Includes reader’s Diary and December Calendar–also available in Braille.